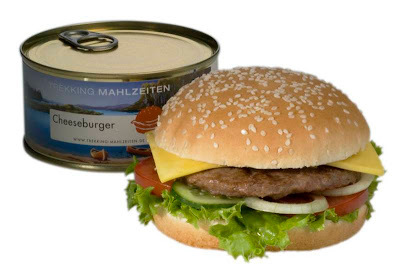 The Frankenfood sure signs the world is coming to an end theme continues today with the world's first cheeseburger in a can. Dollars to donuts (an apropos colloquialism perhaps) pull that thing out of the can and it ain't going to look like that picture. This product actually surprises me - mainly because of the ubiquitous access of fast food globally, though the company that makes it is marketing it for hikers. Wanna buy one? Only 3.95 Euros if you click here.